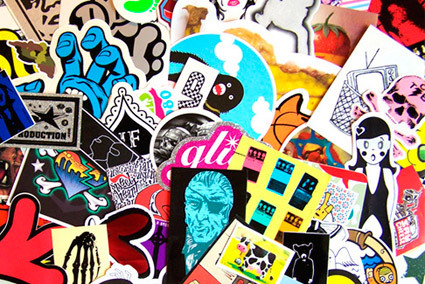 We all love ?em, we all collect ?em – stickers. Over the past decades they have been a way to show others where you from, what you love, and what you’re up to by decorating most cars, boards, notebooks or furniture like refrigerators around the world to spare us the plain white or chromatic sight. Some of you keep classics like Santa Cruz’s “Screaming Hand” or the 12” sticker of the second Beatnuts vinyl record well sorted in their sideboards others have dusty shoe boxes hidden (or forgotten) in their basements and roof truss, waiting to be dug out by some modern type of archaeologist and to be worshiped in a more special place – Meet the “Hatchquarter”, the World’s first sticker Museum. Placed in a sideway close to Berlin Friedrichshain’s famous “Simon Dach Strasse” you can catch a view on some visual highlights from 20 years of sticker obsession. Hatch is supported by Carhartt and owned by Oliver Baudach. Oliver runs the permanent and entrance free exhibition providing you non-stop with information about adhesive labels, better known as stickers. It shows extracts of culture, creativity, advertising medium, commerce, street art that are not mutually contradictory in Oliver’s opinion. Check out their website hatchkingdom.com for more information on Hatch and the Hatchquarter.